It wouldn't be Riverdale without a little drama now and then. There's been no shortage lately as Hiram Lodge's mayoral campaign turned the town upside down, Betty's band battled Veronica's, and Archie's reconciliation with Betty didn't go unnoticed by their significant others. Things are about to get worse. 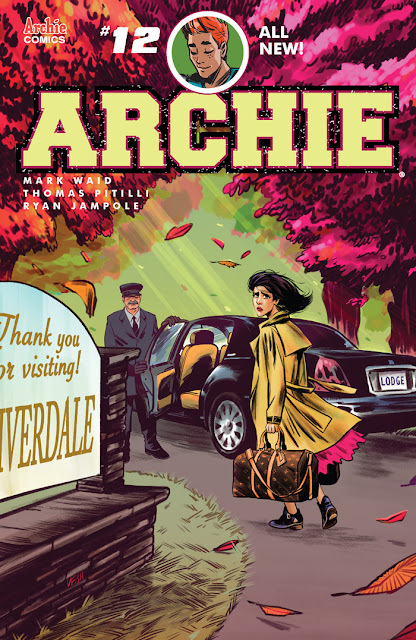 Mark Waid has done some of his best work writing 'Archie,' capturing the fun of the classic series with a modern emotional center that makes the Riverdale gang more grounded and relatable than ever. At times the behavior of the kids can be childish and selfish as teens sometimes do. They don't always react maturely and let their emotions carry them. Waid understands this and allows his characters to figure it out and end up doing the right thing. Betty, for example, does the mature thing and has a heart to heart with Veronica. Archie and Betty may be friends again, but they've put their significant others in difficult situations. Issue twelve examines those very consequences leading to more turmoil in Riverdale. Artists Ryan Jampole and Thomas Pitilli with colors from Andre Szymanowicz create a familiar bright landscape littered with familiar faces. Except the tone is tense, dour, and melancholy despite the usually sunny surroundings. This mood is expressed perfectly in the faces of the characters. There are some fun panels though, it's not all doom and gloom. Hiram Lodge's reaction to the election results and Betty's reckless driving allow the artists to cut loose a little. Waid continues to write with all the insight and tenderness of an awkward teenager proving there's virtually nothing he can't write. 'Archie' is a great comic with classic beloved characters and a modern twist. He keeps creating multi-dimensional characters out of long-established figures, finding new depths to their personalities. 'Archie' is more accessible and entertaining than ever.